The music is by Vivaldi and is the opening of the “Spring” section of his Four Seasons concertos. It is bright and upbeat, just like the spring after a dark cold winter. Spring is often associated with new beginnings. The world looks new again; the frosts have passed (if you live in a place that has frosts.). Spring is also when the library book sales begin (some go on all year long, but the spring and summer is a popular time for annual book sales). Since first introduced to library book sales I have been a great fan of them and have found some marvelous books. Right now my favorite is an edition of John Gower’s poetry that was published in the early 1800’s and is bound in rather old and fragile leather. There was an article in an edition eSchool News recently about the struggles school libraries are having meeting the requirements for 21st century technology standards while maintaining their traditional services. Libraries are marvelous places and most cities of any age or reputation take pride in their libraries. It is an essential part of any school. How, after all, can students be taught to do research, especially historical and literary research, if the school does not have an adequate library. Add to this fact that the world is changing radically and the way research will be done in the very near future bears little resemblance to how it was done when I was in school. How will our students survive in the 21st century world of college and of work if they are being trained for the world as it looked and behaved yesterday? It is expensive to prepare students for the world they will encounter and relatively cheap to prepare them for the world that was. We are living in an age, it seems, where cost takes priority over value. 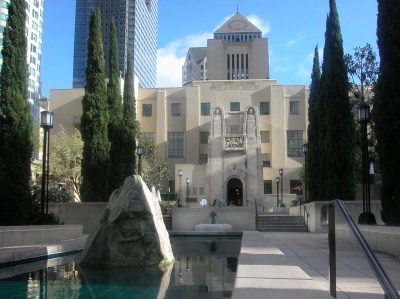 The image at the top is of the Los Angeles Public Library. It often appears in movies, especially television movies, but rarely as a library. The last time I saw it in a movie it was supposed to be a courthouse. A few years before I moved from Los Angeles to Massachusetts the library was seriously damaged by a fire. The city rallied to restore it by donating large sums of money to restore the building and its collections. Even a local pastor known for his ability to raise large sums of money conducted a few fundraisers in support of the cause. The library was successfully rebuilt and though some aspects of its collection that were lost were irreplaceable (if I remember correctly it had copies of every addition of the Los Angeles Times since it first began publication), it has a healthy collection once again. I think this is a testament to a community’s commitment to learning. Perhaps times were better than. I think that it is interesting that the symbolism employed by the structure, the pyramid on top being the most obvious, is Egyptian (one of the old classic movie houses was also called “The Egyptian Theater” but it may have disappeared in my absences). I like to think this is a nod to the most renowned of classical libraries, the Library at Alexandria, Egypt. But being next door to Hollywood it may have more to do with the silent film version of Cleopatra. The library serves as a kind of symbol of a culture’s literacy and its commitment to literacy and scholarship. 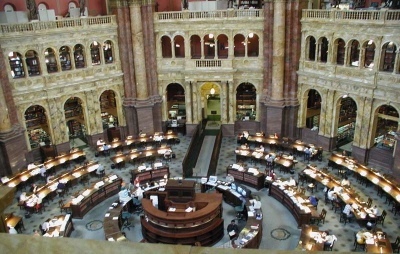 This paragraph is sandwiched between two images of famous library reading rooms, that of the Library of Congress and that of the British Museum. Thomas Jefferson sold his book collection to the nation to start the Library of Congress. The British Museum’s reading room has seen many important works assembled beneath its roof and at its reading tables. I am told, for example, that it was here that Karl Marx worked on his Das Capital. On a different side of the coin Mahatma Gandhi also used the Museum’s reading room. There is something inspiring about the thought of so many people doing serious scholarship (and I am sure some not so serious scholarship as well) at these tables jammed on top of each other. If everyone did not work quietly it would be very difficult for anyone to work at all. The Library of Congress, at least in this photograph, has only tables, books and papers, while the British Museum Reading Room is equipped with banks of computers. I have not seen a card catalog in a library in a very long time and I imagine even in the Library of Congress the traditional catalog is being replaced by the computer and the digital card catalog. Maybe not, it is one of those things I will have to check out. There was an article in the Sunday Guardian on The Free Access World Digital Library. According to the article a number of the world’s major libraries worked together to put their collections online so that they could be accessed anywhere by anyone. The project was the idea of the librarian of the Library of Congress. When the European version was given a test drive it had so many visitors it had to shut down temporarily because it could not handle the traffic. For those interested in seeing a sample of what the library houses there is an online sampler of sorts. The irony of this is that about a month earlier The Guardian published a different article on the disappearing libraries (actually it is series of photographs of library scenes, one of which is the original British Museum reading room). It is odd that at a time the “World Library” suggests the interest in libraries is great, libraries are struggling to survive. I have an iPod Touch. I also learned this week that through Google Books I can gain access, when I am online, to a huge library of digitized books. This library is available to anyone with a computer, a smart phone, or a device like the iPod Touch. This suggests, among other things, that the library of the future will be a very different place. Copyright laws and such have to be worked out, but that is likely only a matter of time (I suppose until those with the power to say yes recognize a library is a library). My iPod already has about fifty books on it and with the Google app I have access to thousands of books, as long as I also have access to the web and the server is not down. 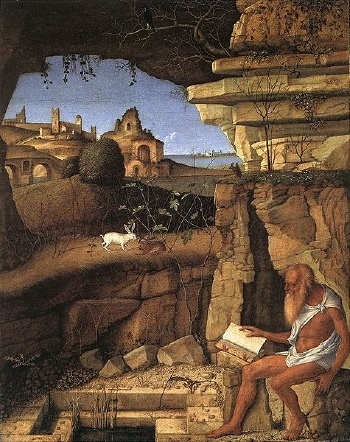 If one does not look too intently one could almost imagine that the book in front of St. Jerome is in fact a Kindle. Jerome lived in a time when a book was copied by hand and was probably quite costly. About a thousand years later Gutenberg and moveable type made books available to most anyone who could read one and about two thirds of a millennia later books as we know them are perhaps becoming obsolete. The book itself, though, will probably take on another incarnation and survive in a somewhat different form for another millennia or two. The film clip shows strange creatures in pursuit of knowledge, learning, and a good story. In the book that inspired the clip a bookstore or a library can be a dangerous place and the championing of a literary text could get a person in very serious trouble. Perhaps a book is a dangerous thing. The ideas found in Jefferson’s library inspired a revolution, as did the ideas developed in the great library of Britain. What is the difference between a good idea and a dangerous one, ideas like Jefferson’s and Ideas like those of Marx? Is it Marx’s ideas that are dangerous or only the way that those ideas were implemented? Like many valuable things in life thought and the ideas that thought produces come with their own special dangers. The photo of Radcliffe Camera of Bodleian Library, the main research library of the University of Oxford. The Bodleian Library is affiliated with one of the word’s oldest and most prestigious universities. 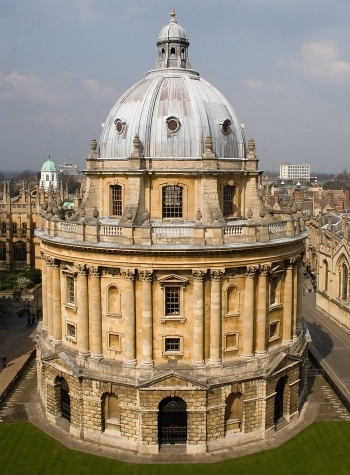 The Radcliffe Camera originally housed the science library and dates back to the eighteenth century. In the mid-nineteenth century it was made a part of the Bodleian, the Universities principle library. J. R. R. Tolkien, according to Wikipedia, thought this building looked like Sauron’s Temple to Morgoth, which suggests a view of some towards libraries, especially libraries dedicated to science. Perhaps Tolkien’s view of this library has more to do with the time he spent there as an undergraduate than with his view of libraries in general. I think libraries are exciting places, especially in springtime. Harold Bloom talks about reading his way through libraries. He read the books of various libraries, though I do not know if that means he read everything or only the things that interested him. I have never read my way through a library but the idea is an appealing one, though probably unlikely for one with a reading speed like mine. It was said of Milton that he had read every book that was available in print in his lifetime. He was a very learned man, and knew enough and read enough to make the story plausible. If Google and all the other folks trying to digitize libraries are successful it may not be long before we can carry in our pockets every book that Milton was thought to have read, even if we cannot find the time to read them ourselves. Spring is an exciting time of year. When I see the trees turning green and hear the birds again, then I know spring is finally here. For me, spring marks nearing the end of the school year, and summer is not far away. I personally loathe winter and the cold so I always love spring time. Libraries have definitely been struggling lately, even the public library right here in Wareham. The Free Access World Digital Library sounds very interesting. Technology has brought libraries a long way. It is truly amazing what such a small handheld device can do. Spring symbolizes new life and a new beginning. I always get so excited when i see the first flower sprout from the once frozen earth. Everything turns back to green again. The earth around us is warm and full of life. Best of all summer is on its way. The stress and demand of school will soon be pushed aside and life of sun by the pool will replace it. Spring is excitement. It allows many of us to look forward long days at the beach, fireworks in the humid summer nights, popsicles dripping down our fingers. Spring foreshadows and excites us for the months approaching. It takes away the death and cold that tags along with winter. When spring time approaches I know that school is almost out. This is what i wait all year long for. No longer do I feel so much stress, knowing that summer is just around the corner. I feel that I am able to breathe again. Everything appears to come to life, the birds begin singing and the bright flowers begin to bloom. This awakening of environment gives me a cheery feeling and I no longer feel sleepy from the long frozen winters. This affect can be seen all over town. You are met by people with smiling faces that once looked a little gloomy, as if the winter had turned them cold. Thanks. It is also a pleasant past time.